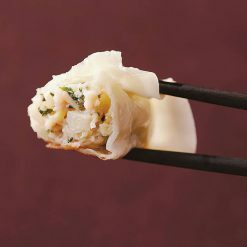 These gyoza give off the invigorating fragrance of shiso leaves. The shiso leaves used in this item were grown without pesticides. With these gyoza, you can experience the refreshing fragrance of domestically produced green shiso through both taste and smell. 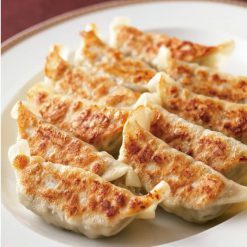 These gyoza are made without garlic or garlic chives so as to better highlight its flavor. The shiso in this item is about twice as fragrant as other commercially available shiso. The ratio of pork and chicken in this item is 2:1. Distribute 1 tablespoon of oil in a heated frying pan, then add the gyoza (still frozen) (if using a Teflon pan, no oil is necessary). 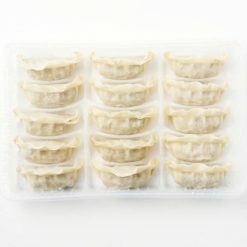 Add enough water (80ml) to submerge the bottoms of the gyoza, cover with a lid and steam-bake on medium heat for about 5 minutes. Just before the water has all evaporated, lower the heat a little and add 1 teaspoon of oil. Distribute the oil evenly throughout the pan. Fry for about 2 minutes. When the bottoms of the gyoza look pan-fried, they are done. This product contains vegetables [cabbage (domestic), shiso (domestic), onions (domestic), ginger (domestic)], meat [pork (domestic), chicken (domestic)], pig fat, gelatin, potato starch, flavoring extract (chicken, pilchard, yeast, oyster) granulated soy protein, egg whites, sugar, table salt, fish sauce (pilchard, shrimp), shrimp oil, pepper, wrappers (wheat flour, table salt).. This product is not suitable for anyone with allergies to egg, wheat, shrimp, soy, chicken, pork or gelatin. Origin of ingredients: cabbage/shiso/pork/chicken (domestic). Prepared and packaged in Japan.